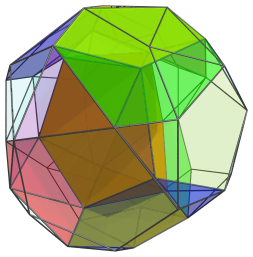 The 120 vertices of the 600-cell can divided into 5 sets of 24 vertices each, corresponding with 5 inscribed 24-cells. 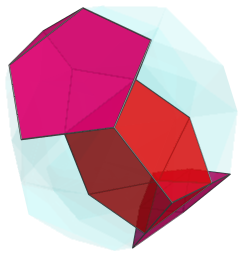 If we remove the 24 vertices of one of these 24-cells, the convex hull of the remaining vertices forms a snub 24-cell. If we remove the 48 vertices corresponding to two of these 24-cells, the convex hull of the remaining 72 vertices is a polychoron with 48 cells, all of which are tridiminished icosahedra. 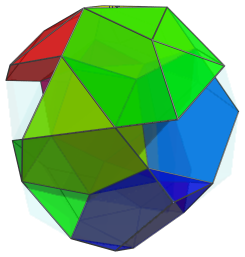 This we call the bi-icositetradiminished 600-cell. 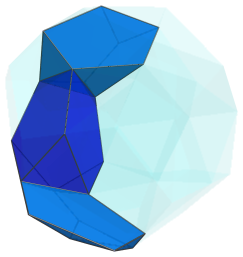 The bi-icositetradiminished 600-cell is a member of the CRF polychora, a class of non-uniform, convex, regular-faced polychora that generalizes the Johnson solids to 4D. 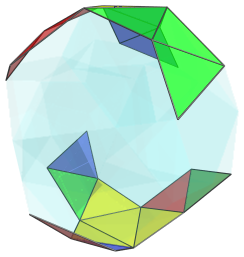 All of its ridges are regular polygons, and all of its cells are Johnson solids. Unlike many of the CRF polychora, however, which generally have a low degree of symmetry, the bi-icositetradiminished 600-cell has an interesting skew symmetry directly related to the Hopf fibration of the 4D sphere. 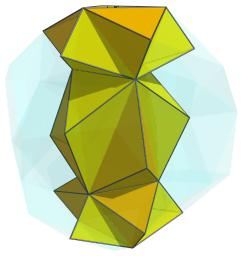 This symmetry makes it both vertex-transitive and cell-transitive, which is quite unusual for CRF polychora. 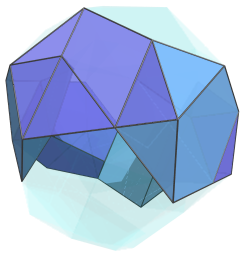 This will become clear below as we explore its structure. 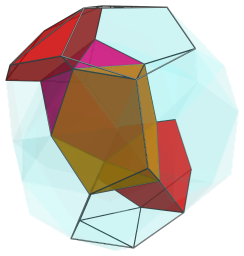 We shall explore the structure of the bi-icositetradiminished 600-cell by means of its parallel projection into 3D. The above image shows the nearest cell to the 4D viewpoint. 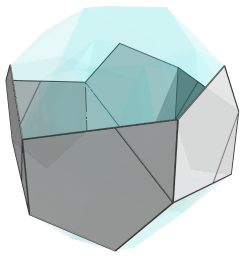 For clarity, we omit edges and vertices not on this nearest cell, and render all other cells in a transparent color. 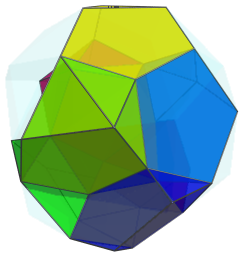 For convenience of description, we'll refer to the triangular face surrounded by pentagons as the “top” face of the tridiminished icosahedron, and the triangular face surrounded by other triangular faces as the “bottom” face. The three remaining triangular faces that surround the bottom face will be referred to as the “lateral” triangles. 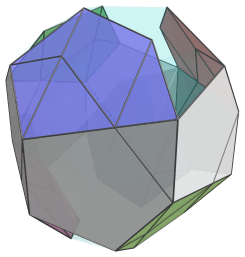 We shall use this terminology to identify specific faces of all of the tridiminished icosahedra we will encounter, even if their projection images may appear in other orientations such that their “top” face won't really be at the top. 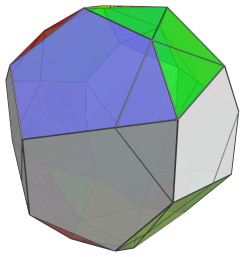 This tridiminished icosahedron appears flattened, because it is seen from a 60° angle. In 4D, it is exactly the same shape as the nearest cell. 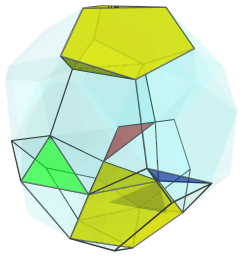 Each of these tridiminished icosahedra also shares a pentagonal face with the bottom yellow cell. 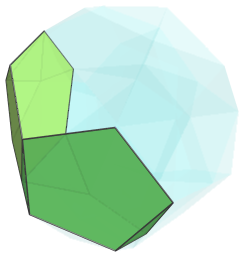 For clarity, we've hidden the ridges of the nearest cell, leaving only its edge outline, so that the placement of the bottom faces relative to it is clear. 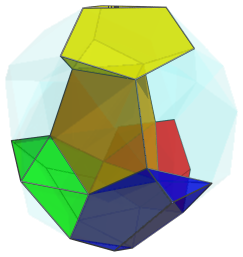 Thus, these three cells are arranged around the central column of three cells in a kind of skew-circular fashion. 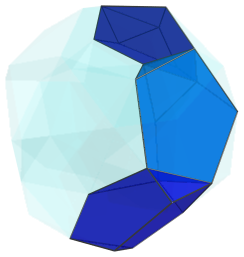 Their bottom faces are joined to three more tridiminished icosahedra, each of which shares a pentagonal face with the nearest cell. If you look carefully, you'll notice that the top faces of these cells are joined to the bottom faces of the previous 3 cells. 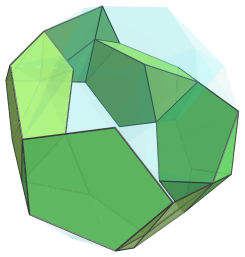 Thus, we see a continuation of the pattern that the top face of each cell is joined to the bottom face of another cell, and vice versa. 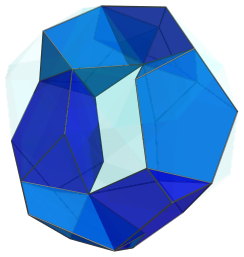 This is an important feature of the symmetry of the bi-icositetradiminished 600-cell, as we will see later. For clarity, we show only the edge wireframe of the top and bottom cells in the central column. We have deliberately chosen the colorings of the cells so that cells in the same chain have similar colors. The wrapping of these chains around the central column is especially obvious with the blue chain. The topmost and bottommost cells of each of these rings appear to be flattened into irregular pentagons: this is because they lie on the limb, or the “equator”, of the bi-icositetradiminished 600-cell, and are seen at a 90° angle. 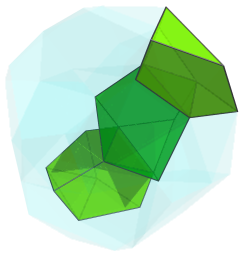 In 4D, they are exactly the same as all the other cells. Together with the central column of cells, there are altogether 7 sets of cells, 4 sets with 3 cells each, and 3 sets with 4 cells each, making a total of 24 cells. Six of these cells lie on the equator, and the remaining 18 are on the “near side” of the bi-icositetradiminished 600-cell. For the sake of clarity, we render all of the other cells we've seen so far in a light transparent color so that the equatorial ring is clearly visible. The cells of this equatorial ring lie along a great circle on the surface of the bi-icositetradiminished 600-cell; this fact, together with the fact that the members of this ring are all attached to each other via their top and bottom faces, suggests that the spiralling chains we saw earlier are merely parts of their respective complete 6-membered rings. As we shall see, this is, in fact, the case. There are 20 triangles in total. They are not the projection image of any equatorial cells; they are where cells on the near side touch cells on the far side. Their colors show which chains they touch. They appear to be interpenetrating, but this is merely because both halves of the ring lie along the same line of sight. 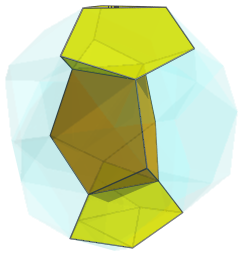 In 4D, they form regular hexagonal ring. Thus, there are 8 rings in total: the vertical ring including the nearest cell; the 3 rings immediately surrounding it; the 3 other rings at a shallower angle; and the grey and white ring on the equator. Each ring has 6 cells, and therefore there are 48 cells in total. These rings are actually all equivalent to each other via an appropriate rotation. Each cell in a ring is also equivalent to the other cells in the ring. 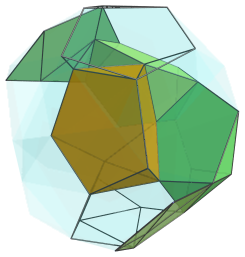 The bi-icositetradiminished 600-cell is therefore cell-transitive. 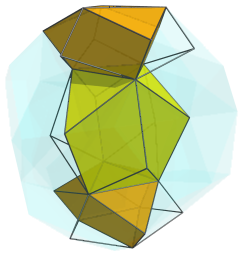 This ringed structure directly corresponds with the Hopf fibration of the 4D sphere: each ring corresponds with a fibre, and they spiral, or swirl, around each other to close up the surface of the polytope. This kind of structure corresponds with the class of non-convex uniform polychora known as the swirlprisms, and also reflects the structure of Jonathan Bowers' regular polytwisters. 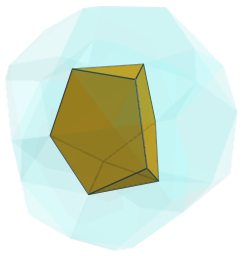 The following animation shows the first and fourth rings rotating in the plane of the first ring. The alternating orientation of the cells is quite obvious. 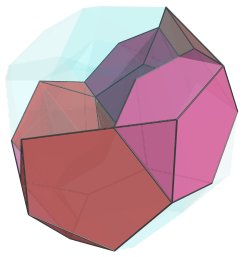 The cells appear to be mutually intersecting, but this is only an artifact of the projection. 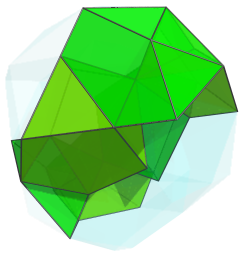 In 4D the cells do not intersect each other. Last updated 14 Apr 2018.